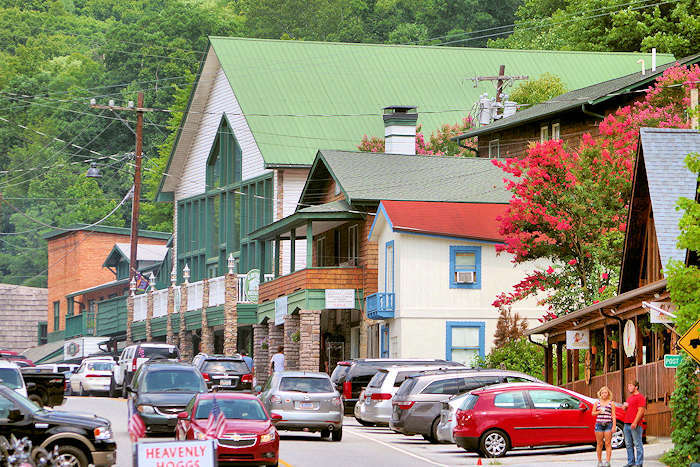 Maggie Valley has been a popular family resort town in the mountains of North Carolina for many years. It's only 35 miles west of downtown Asheville. 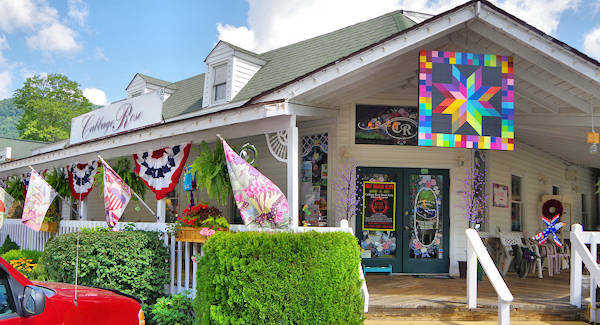 It's a laid-back, "old-fashioned" town with vintage motels, fun festivals, car and motorcycle rallies, plenty of craft shops for browsing and lots of other to do. Get in touch with your inner hillbilly with bluegrass music, moonshine and clogging. Most all businesses are located along Soco Road, a five-mile stretch of US Highway 19. Your first stop should be the Maggie Valley Visitor Center (1110 Soco Rd), open every day with friendly and helpful locals. 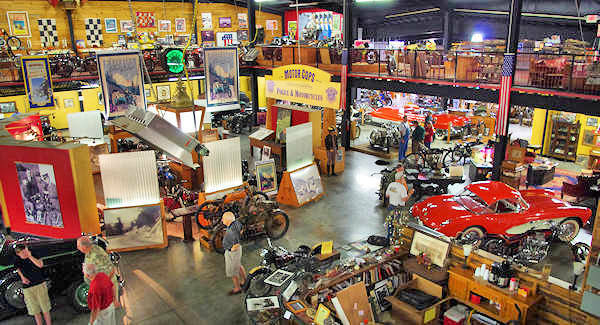 A must-see is Wheels Through Time (62 Vintage Lane - along Soco Road), an impressive motorcycle and car museum with an amazing collection of many rare items. They are open April-November. Read more. New in town is Elevated Mountain Distilling (3732 Soco Road), located just a mile from Wheels Through Time. 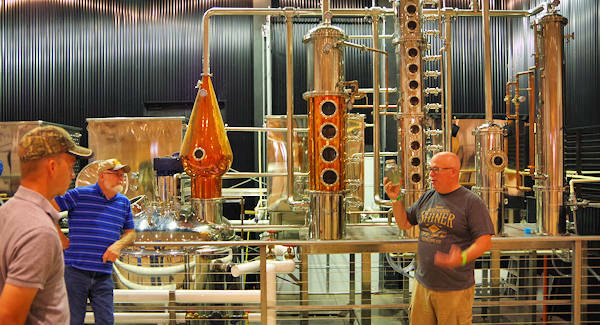 Take a free tour and see the fanciest moonshine still around. Taste some of their spirits and browse their store with great t-shirts and souvenirs. Read more. 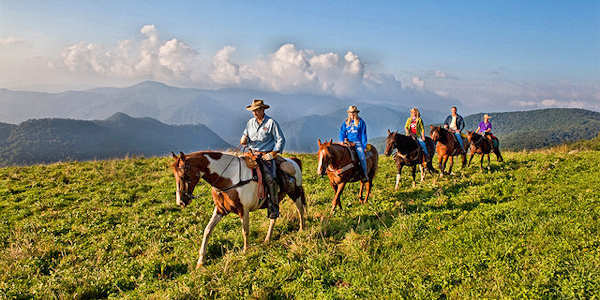 Stay on a ranch and ride horses high in the Great Smokies at Cataloochee Ranch. Or stop by for lunch, dinner and hiking. Read more! Plus, find many mom-and-pop motels in Maggie Valley with that authentic vintage, down-home style with much lower rates than Asheville. Go to the Maggie Valley website for a motel directory. Don't miss the longtime favorite Cabbage Rose (3388 Soco Road), a knick-knack shopper's dream complete with a Christmas Shop. Be careful, you could get lost in this big place packed with things you didn't know you needed! New in 2018 is the Soco Wine Shop (2779 Soco Road), the only fine wine market in the valley. 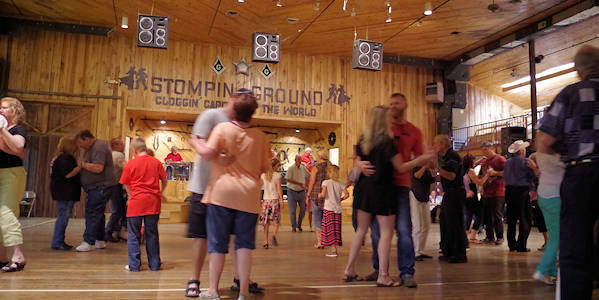 Watch Appalachian dance at Stompin' Ground (3116 Soco Road), the clogging capital of the world. Dance with your honey to live country and bluegrass music (clogging lessons offered). They are only open on Saturday nights, April through October. See our Stompin' Ground Guide. The Maggie Valley Opry (3605 Soco Road) is very simple in appearance but boasts legendary performances by owner Raymond Fairchild, a five-time "Banjo Player of the Year". He's a lifetime member of the "Bluegrass Hall of Fame" and has recorded 20+ albums during his 50+ years in music. Showtime is 8 PM on Thursday-Saturday nights, April-October. 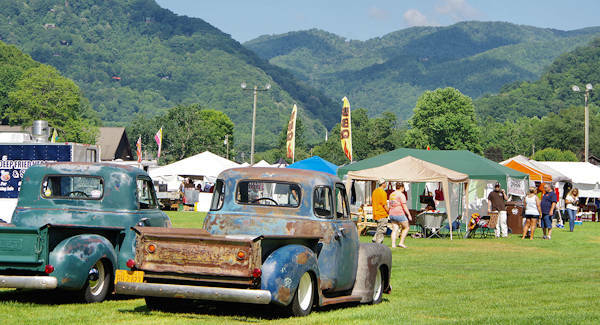 The Maggie Valley Festival Grounds (3422 Soco Road) hosts a big variety of events year-round, including the Hillbilly Jam, art festivals and many car shows and rallies. For the latest events calendar for Maggie Valley, go to their website. Cataloochee Ski Area is usually the first open with their 18 mile-high slopes and trails with 100% snowmaking and 3 lifts. Their ski and snowboard school teaches all ages, including a special center for ages 4-12. They are located about 3 miles up the mountain from town. Tube World (4721 Soco Road) offers 12 lanes of snow tubing in the valley. 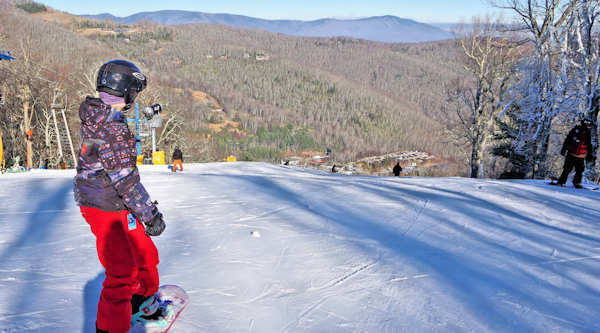 Read more about Cataloochee Ski Area! Nearby Towns: Just five miles east is Lake Junaluska and eight miles away is downtown Waynesville. Cherokee is 17 miles west. Directions from Asheville (35 miles): Take I-40 West to Exit #27 (US 74) for the Great Smoky Mountains Expressway. In about 4 miles, take exit 103 for US 19 South/Maggie Valley. More: For additional info on things to do, restaurants and places to stay in Maggie Valley, go to their website. This rare twin waterfall is located roadside near Maggie Valley and Cherokee. You can easily miss it since there are few signs! The observation deck is a short walk from a small parking area. You can also hike down to the base of both falls. This beautiful lake town near the Great Smoky Mountains is home to trails, boat tours, golf, gardens and a big variety of lodging options, including lakefront hotels and cabin rentals for a Methodist church retreat. 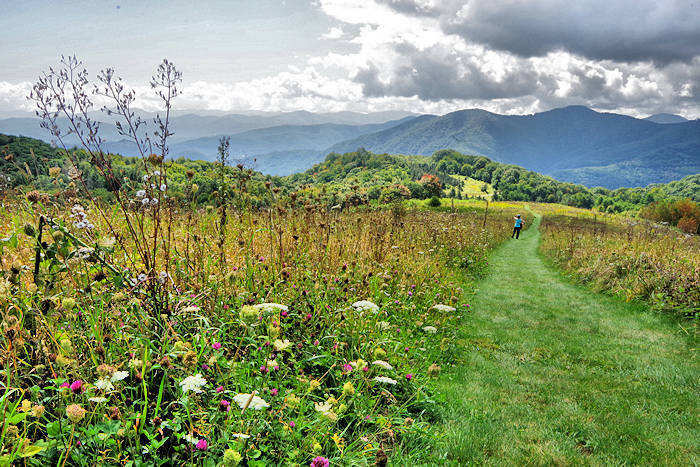 Order the 56-page free "Visit NC Smokies" guide to Haywood County, home to small towns of Maggie Valley, Waynesville, Lake Junaluska, Canton and Clyde - in the Great Smokies, Pisgah National Forest and along the Blue Ridge Parkway. 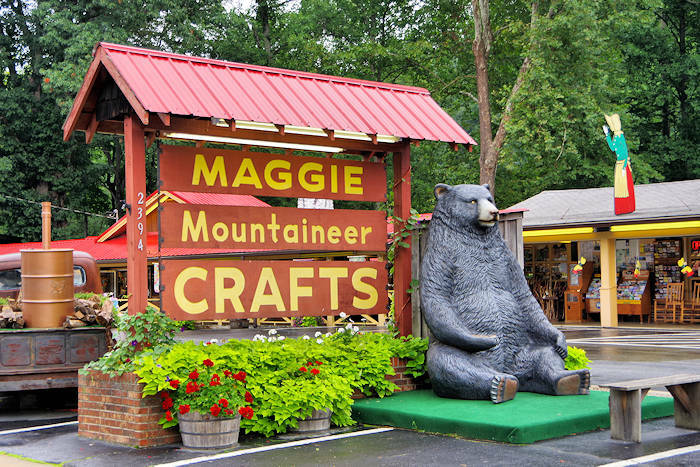 Meet 100 artisans and crafters from the Southeast with a big variety of art, outdoors at the Festival Grounds (3374 Soco Road) in Maggie Valley. 9 AM-4 PM each day. Free admission and parking. 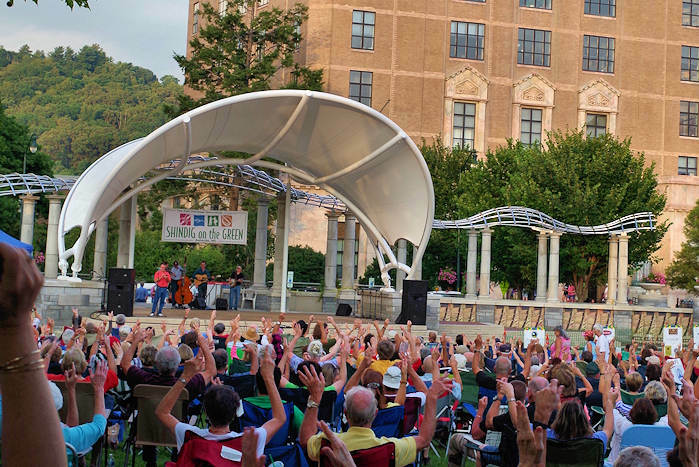 Head to Maggie Valley to celebrate mountain country living with music, crafts, big car show, moonshine and TV celebrities. 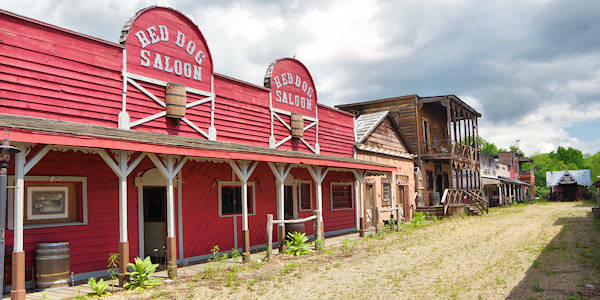 Ghost Town Reopening in 2019? Ghost Town in the Sky: This longtime favorite amusement park has been closed for years. We are very excited about effort to renovate and reopen it - hopefully in late 2019 or 2020. Take a behind the scenes photo tour!